United Kingdom, Republic of Ireland, 12 May 2015 – Canon today adds two new powerful models to its long-standing binocular range – the 12×36 IS III and 10×30 IS II. 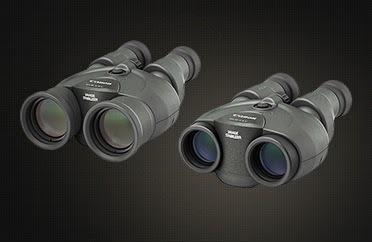 Ideal if you’re looking for a stable and superb-quality view of your subject, these high-magnification binoculars – offering 12x and 10x magnification respectively – combine Canon’s optical heritage and innovative Image Stabilizer technology. Both models deliver exceptional quality and a new standard of performance, whether you’re catching the action on safari, at an air show or exploring the outdoors. The binoculars deliver a high quality viewing experience, thanks to a combination of Canon’s Porro II prism based optics and Super Spectra Coating. Both feature doublet field-flattener lenses, providing edge-to-edge sharpness, excellent resolution and ultra-low distortion across your entire field of view, so regardless of where the subject is, you’ll be able to see it in pin-sharp detail. The Super Spectra lens coating, also found in Canon’s EF lens range, delivers first-class colour reproduction, helping you to easily distinguish one breed of bird from another, in addition to suppressing visible flare and ghosting. The 10×30 IS II offers 10x magnification with a 30mm diameter front optic, while the 12×36 IS III lets you get even closer with 12x magnification and 36mm front optic. Both models provide vivid detail and stunning quality for when you’re watching long distant action and movement. Canon’s binocular range features an active optical Image Stabilizer, steadying the view when you’re walking, in the back of a bumpy safari truck or in a hot air balloon, enabling you to clearly see in front of you. The vari-angle prisms reduce handshake, steadying the subject and minimising eye-strain, great for lengthy sporting events where you don’t want to miss the action and use the binoculars over long period of time. The Image Stabilizer can be activated immediately, with the simple press of a button. Additionally, whether you’re bird watching, or trekking through a jungle wildlife spotting, it’s easy to track a bird in flight, thanks to the binoculars providing smooth panning support. The binoculars offer a lightweight design, comfortable ergonomics and ruggedness in a compact size that easily fits in your bag. Easy to hold, weighing just 660g and 600g, the 12×36 IS III and 10×30 IS II are ideal for you to take anywhere, so you’re ready for every adventure. A soft-touch silicon rubber eyecup ensures comfort and can be easily adjusted to match your eyesight, or you can use the binoculars whilst wearing glasses, without the field or view distorting or visible vignetting. Perfect for bird watching amongst flora, both models have an anti-reflective coating on the body, making the binoculars even more discreet than predecessors. Both models are powered by AA batteries, providing approximately nine hours of operation¹, with battery consumption significantly reduced compared to predecessor models. Built using Canon’s optical heritage, the 12×36 IS III and 10×30 IS II revitalise Canon’s current binocular range, and will replace the 12×36 IS II and 10×30 IS models. Designed for a wide spectrum of activities, from stargazing to yachting, the range currently features six models, offering 8x to 18x magnification. With certain models built for resistance against harsh weather and immersion in water, they all feature Canon’s prestigious Image Stabilizer technology, SSC lens coating and field flattener lenses, for a superb, comfortable viewing experience.